There’s nothing like a soft, chewy pretzel bite to curb your snack cravings. 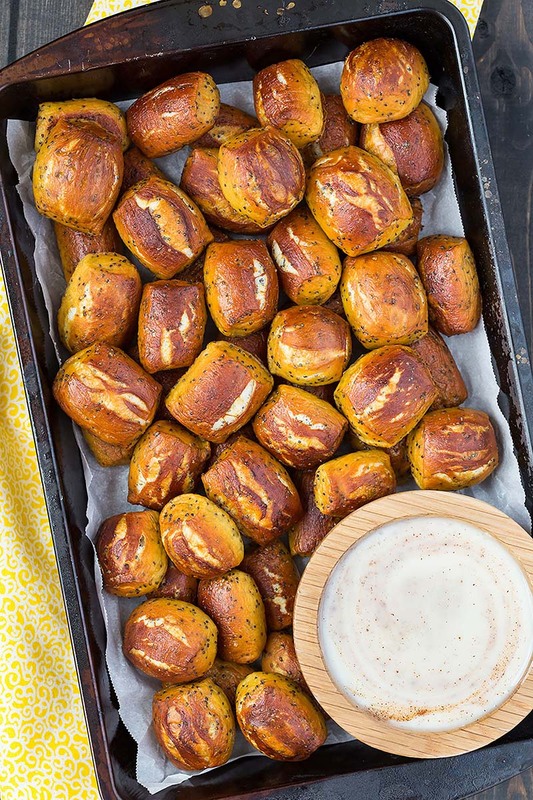 These lemon poppy seed soft pretzel bites are perfectly bite-sized and are extra delicious when dipped in a cool, creamy honey yogurt sauce. In a small bowl, stir together the warm water, brown sugar, and yeast. Let sit for about 5 minutes, until the yeast is dissolved and foamy. In the bowl of a stand mixer fitted with a dough hook (a wooden spoon can also be used), combine 2 cups of the flour and salt. Add the butter, honey, and milk to a small saucepan. Heat over low heat until the butter has melted and mixture is steaming but not boiling. Pour the milk mixture into the flour. Add the lemon zest, lemon juice, and poppy seeds; stir with a whisk. Add the yeast mixture and stir with a whisk. Turn the mixer on medium low speed and gradually add ¼ cup at a time of remaining flour until the dough is no longer sticky. Press a finger into the dough. If it bounces back, it is ready to knead. Turn the dough out onto a lightly floured surface and knead gently for about 5 minutes. Shape the dough into a ball and place it into a lightly oiled bowl. Brush a little oil over the top and cover the bowl with a tea towel. Place the bowl in a warm place to rise for 1½ hours, or until doubled in size. Preheat the oven to 425°F. Line two large baking sheets with a silicone mat or parchment paper. Set aside. Using a sharp knife or the edge of a bench scraper, cut the dough into 8 equal portions. Roll each portion out into a 20-inch long rope. If the dough wants to shrink back, let it rest for 5 to 10 minutes. Cut each rope into 1½-inch pieces. Bring 10 cups of water with baking soda to a boil. Drop 10 pretzels at a time in to the water bath and let sit for 15 to 20 seconds. Remove with a slotted spoon and place them onto the prepared baking sheets. Brush the pretzels with beaten egg. Sprinkle the tops with coarse sugar just before going into the oven. Bake for 15 minutes or until golden brown. Remove from oven and serve with honey yogurt dip. The pretzels will remain fresh for up to 3 days in an airtight container. Combine the yogurt and honey in a small bowl. Stir until well combined. Sprinkle the cinnamon over the top and use a spoon to swirl in into the yogurt mixture. Recipe created by Baked by an Introvert.